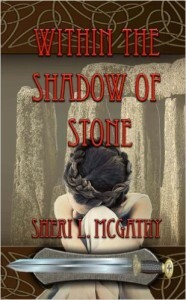 Within the Shadow of Stone is a journey through legend and myth to the time of the ancient standing stones—to a world where warriors are bound to the stone and the Shroud Born walks within the mist. Bree of Clan Dunstan, and her people, the Skye, worship the stones, though the Skye fail to remember the reason why. The people no longer hear the song within the solemn megaliths for the Skye have forgotten how to sing. Now, as the pulse of the land slows, and the seasons falter, it is to the stones that Bree, a true Shroud Born, must turn, and their whispers she must hear. For within the still forms is a truth that could save her, and the stones, if only she will listen to their call. ~ When your need is truly great, the stone shall not forsake.